The oceans are the planet's most important depository for atmospheric carbon dioxide on time scales of decades to millenia. But the process of locking away greenhouse gas is weakened by activity of the Southern Ocean, so an increase in its activity could explain the mysterious warmth of the past 11,000 years, an international team of researchers reports. The warmth of that period was stabilized by a gradual rise in global carbon dioxide levels, so understanding the reason for that rise is of great interest, said Daniel Sigman, the Dusenbury Professor of Geological and Geophysical Sciences at Princeton. Scientists have proposed various hypotheses for that carbon dioxide increase, but its ultimate cause has remained unknown. Now, an international collaboration led by scientists from Princeton and the Max Planck Institute for Chemistry point to an increase in Southern Ocean upwelling. Their research appears in the current issue of the journal Nature Geoscience. "We think we may have found the answer," said Sigman. "Increased circulation in the Southern Ocean allowed carbon dioxide to leak into the atmosphere, working to warm the planet." Their findings about ocean changes could also have implications for predicting how global warming will affect ocean circulation and how much atmospheric carbon dioxide will rise due to fossil fuel burning. 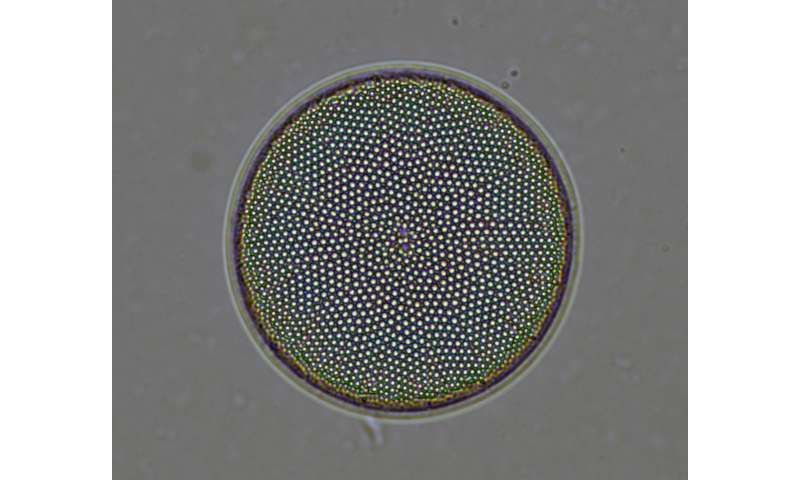 For years, researchers have known that growth and sinking of phytoplankton pumps carbon dioxide deep into the ocean, a process often referred to as the "biological pump." The biological pump is driven mostly by the low latitude ocean but is undone closer to the poles, where carbon dioxide is vented back to the atmosphere by the rapid exposure of deep waters to the surface, Sigman said. The worst offender is the Southern Ocean, which surrounds Antarctica. "We often refer to the Southern Ocean as a leak in the biological pump," Sigman said. Sigman and his colleagues have found that an increase in the Southern Ocean's upwelling could be responsible for stabilizing the climate of the Holocene, the period reaching more than 10,000 years before the Industrial Revolution. Most scientists agree that the Holocene's warmth was critical to the development of human civilization. The Holocene was an "interglacial period," one of the rare intervals of warm climate that have occurred over the ice age cycles of the last million years. The retreat of the glaciers opened a more expansive landscape for humans, and the higher concentrations of carbon dioxide in the atmosphere made for more productive agriculture, which allowed people to reduce their hunter-gathering activities and build permanent settlements. The Holocene differed from other interglacial periods in several key ways, say the researchers. For one, its climate was unusually stable, without the major cooling trend that is typical of the other interglacials. Secondly, the concentration of carbon dioxide in the atmosphere rose about 20 parts per million (ppm), from 260 ppm in the early Holocene to 280 ppm in the late Holocene, whereas carbon dioxide was typically stable or declined over other interglacial periods. For comparison, since the beginning of industrialization until now, the carbon dioxide concentration in the atmosphere has increased from 280 to more than 400 ppm as a consequence of burning fossil fuels. "In this context, the 20 ppm increase observed during the Holocene may seem small," said Sigman. "However, scientists think that this small but significant rise played a key role in preventing progressive cooling over the Holocene, which may have facilitated the development of complex human civilizations." In order to study the potential causes of the Holocene carbon dioxide rise, the researchers investigated three types of fossils from several different areas of the Southern Ocean: diatoms and foraminifers, both shelled microorganisms found in the oceans, and deep-sea corals. From the nitrogen isotope ratios of the trace organic matter trapped in the mineral walls of these fossils, the scientists were able to reconstruct the evolution of nutrient concentrations in Southern Ocean surface waters over the past 10,000 years. "The method we used to analyze the fossils is unique and provides a new way to study past changes in ocean conditions," says Anja Studer, first author of the study, who performed the research while a graduate student working with Sigman's lab. The fossil-bound nitrogen isotope measurements indicate that during the Holocene, increasing amounts of water, rich in nutrients and carbon dioxide, welled up from the deep ocean to the surface of the Southern Ocean. While the cause for the increased upwelling is not yet clear, the most likely process appears to be a change in the "Roaring 40s," a belt of eastward-blowing winds that encircle Antarctica. Because of the enhanced Southern Ocean upwelling, the biological pump weakened over the Holocene, allowing more carbon dioxide to leak from the deep ocean into the atmosphere and thus possibly explaining the 20 ppm rise in atmospheric carbon dioxide. "This process is allowing some of that deeply stored carbon dioxide to invade back to the atmosphere," said Sigman. "We're essentially punching holes in the membrane of the biological pump." The increase in atmospheric carbon dioxide levels over the Holocene worked to counter the tendency for gradual cooling that dominated most previous interglacials. Thus, the new results suggest that the ocean may have been responsible for the "special stability" of the Holocene climate. The same processes are at work today: The absorption of carbon by the ocean is slowing the rise in atmospheric carbon dioxide produced by fossil fuel burning, and the upwelling of the Southern Ocean is still allowing some of that carbon dioxide to vent back into the atmosphere. "If the findings from the Holocene can be used to predict how Southern Ocean upwelling will change in the future, it will improve our ability to forecast changes in atmospheric carbon dioxide and thus in global climate," said Sigman. In reality Holocene warming was initiated by an increase in orbital insolation caused by increased obliquity and precession. But this orbital insolation increase needs a feedback system, and that feedback was not CO2, it was dusty-ice albedo. The dust storms, just before each interglacial, made the ice sheets dirty, so they could absorb more insolation. This was the real mechanism - nothing directly to do with CO2. See Modulation of Ice Ages via Dust and Albedo. And the reason Holocene temperatures stabilised, is that once all the huge northern hemisphere ice sheets had melted, there was no more increase in albedo feedback to be had. CO2 does not have a natural feedback limit at 280 ppm, but melting ice sheets do - once they are gone, they are gone, and there is no more feedback to be had. I don't think the authors are claiming to have found an alternative to the Milankovitch cycles to explain the interglacial warming. I think this is purely based on explaining the increase in CO2 during the Holocene. I've only read the abstract, but am happy to download the paper if clarification is needed. Oh Anonym621406, you are a HOPELESS troll. You should get together with Thorium Boy and maybe the pair of you could figure out a better advertising gimmick for the sludge you two sell?